System Mechanic Professional uses patented technology to optimize computer performance. Also, it protects your privacy and blocks malware attacks. iolo System Mechanic Pro is an excellent tool to find and fix different issues on a windows machine. It uses Intelligent Live Updates from the iolo Labs to keep your computer error free and stable. It cleans your computer by removing unnecessary files and bloatware programs. It also blocks spyware and viruses using dual-engine security. Let’s take a look at the features of iolo System Mechanic Pro. 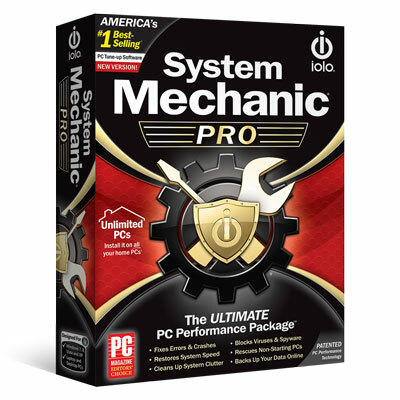 iolo System Mechanic Pro has many features to improve the performance of your pc and make it error free. ActiveCare – removes junk files and correct problems to improve the performance of the PC. LiveBoost – tweak settings to improve the performance of RAM, Processor, and Hard Drive. Modernized Interface – makes it easy to navigate with large text and fast loading. PC Cleanup – removes more than 50 types of junk files. Registry Tuner – removes corrupted registry entries and optimizes it. Privacy Cleaner – cleans cache, history, and cookies that are used to track your sensitive data. Program Accelerator – defrag and aligns program files to make it fast accessible. Startup Optimizer – removes bloatware programs from the startup. NetBooster – increases the speed of downloads, gaming, and internet browsing. Memory Mechanic – quickly catches the wasted RAM to make it available for other programs to use. System Shield – blocks malware by their signature and behavioural analysis. DriveScrubber – erase personal and senstive data permanently. Search and Recover – finds and recover accidentally deleted files. Security Optimizer – scans windows security holes and patches them. Privacy Shield – let you disable aggressive windows personal data collection services. Incinerator – permanently deletes files and make it unrecoverable. iolo System Mechanic Pro home screen displays the status of your computer. You can analyze the system status, and it will recommend actions to take based on the result. On the Problems tab, it displays the list of all the problems on your computer. You can manually select some issues and fix them or can click Repair All to make your PC error free. When you click on the Toolbox tab, it will list all the tools by Clean, Speed Up, Protect, Recover, and Manage category. In the All-in-One category, it contains all the tools available. The ActiveCare tab of System Mechanic Pro lets you manage the settings of Automatic PC Maintenance. You can enable/disable each component from here. The Real-Time Status tab shows status of your CPU, Memory, and Hard Drive on the real-time basis. The Anti-Malware tab shows the status of malware infection on your computer. There is the option to start the scan and enable/disable real-time protection manually. You can also access the Firewall settings from this tab. The Reports tab shows various reports for your PC. IntelliStatus shows Comprehensive PC Status, and History shows you the recent actions, and SafetyNet let you roll back the changes if anything goes wrong. iolo System Mechanic Pro Total Registry Revitalizer lets you repair the registry of windows. It defrags the entries and compacts them for a faster windows experience. It also takes the backup of your registry before making any changes, so that you can recover them if your system doesn’t behave generally after the correction. My PC encountered a serious registry error. The error window keeps coming again and again. System Mechanic Pro fixes that error and it also increases the performance. Now my PC is running smoothly. It is a must-have tool for everyone.